I hope you'll forgive me. I've done a terrible thing. I didn't tell you about Ben Trickey's new album, Rising Waters. To say that it's one of my favorite albums of the year should mean a lot, because it's been quite a crowded field. Maybe it would've come out differently if this were a one-man-with-a-guitar-affair, but Trickey, who has shared the stage with Jason Isbell, Damien Jurado, and Horsefeathers, brought a band along with him this time. The slow crescendo of piano, fiddle, drum, and cello create warmth and a sense of determination that negate the bleakness in the lyrics. 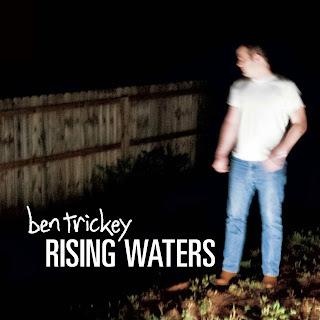 Whether or not the subject matter is the end of the world or the end of a relationship, Trickey's vibrato sounds like the fate of the Earth rests on whichever note he'll land on. But the grit in his words and singing tell us that everything is going to end up okay.